Kazan, July 21, Interfax - Patriarch Kirill of Moscow and All Russia completed the sanctification of the laying down of the foundation of a cathedral on the place where the Icon of Our Lady of Kazan was obtained on Thursday, the Day of the Icon of Our Lady of Kazan. 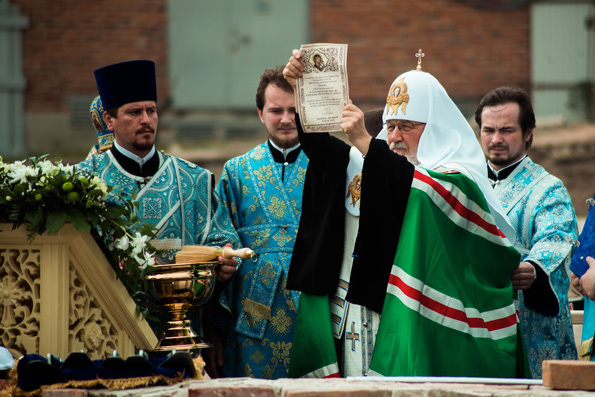 Rustam Minnikhanov, the head of Tatarstan, called the laying down of the foundation for the cathedral a historical event and cited the Bible, saying that there is a time to throw stones and a time to gather stones. “Today we are gathering the stones of our spirituality by rebuilding this world-renowned cathedral,” he said. The ceremony, which was attended also by Talgat Tadzhuddin, supreme mufti of the Central Spiritual Muslim Board of Russia, Tatarstan’s Mufti Kamil Samigullin, and over 1,000 believers, took place on the site of the former Monastery of Our Lady of Kazan. The cross procession led by the patriarch, which had begun at the Kazan Kremlin, came to that place.